The two occupants of the Cessna 185 were not hurt, the fire chief says. JEFFERSON — A group of about a dozen people worked for hours Sunday to pull a small plane out of a bog a few hundred yards south of the Augusta Road where it had crashed Saturday afternoon. Jefferson Fire Chief Walter Morris said Sunday that an eyewitness saw the plane, a Cessna 185, flying low over the trees just before 5:30 p.m.
“He thought it would not end well,” Morris said. The plane, equipped with pontoons, came down in the bog, eventually striking an obstacle, causing it to flip over its nose and land on its roof. When the Jefferson Fire Department arrived on the scene with 19 firefighters and emergency medical technicians, Morris said, two people had gotten out of the plane and were not injured. They were checked out at the scene. Because firefighters smelled fuel, the crash was reported to the state Department of Environmental Protection. A plane is towed Sunday with a rope to Route 126 in Jefferson. The bog is adjacent to Dyer River, which flows into Dyer Long Pond, just west of the north end of Damariscotta Lake, Morris said. Morris said he did not have the names of the two men in the plane. A call to the Lincoln County Sheriff’s Office was not returned Sunday. The Federal Aviation Administration’s registry shows the plane belongs to David Hewitt of Newcastle. Attempts to reach Hewitt on Sunday were unsuccessful. Joe Holland captured the aftermath of the crash on video using his drone. Holland is the owner of the Jefferson Scoop, an ice cream shop about 3 miles away from the crash site. He was hosting a fundraiser for the Jefferson Fire Department on Saturday when the call of the crash came in. Holland said he followed the department down the road, and at the request of Morris and with the approval of the Lincoln County Sheriff’s deputy on scene, he put his drone in the air to survey the crash site. Normally, deploying a drone over the scene of an emergency is illegal, he said. A single-prop airplane is towed Sunday to Route 126 in Jefferson. “The chief asked me to send it up to see if anyone was hurt,” Holland said. The drone also looked for the presence of leaking fuel and debris, and to help find an optimal route for the first responders to the crash to get back out of the bog; it was not how they went in. Holland said people who live on North Mountain Road reported hearing the plane stall and restart three times before the plane went down. “It looks like he was heading for Dyer Long Pond,” he said. 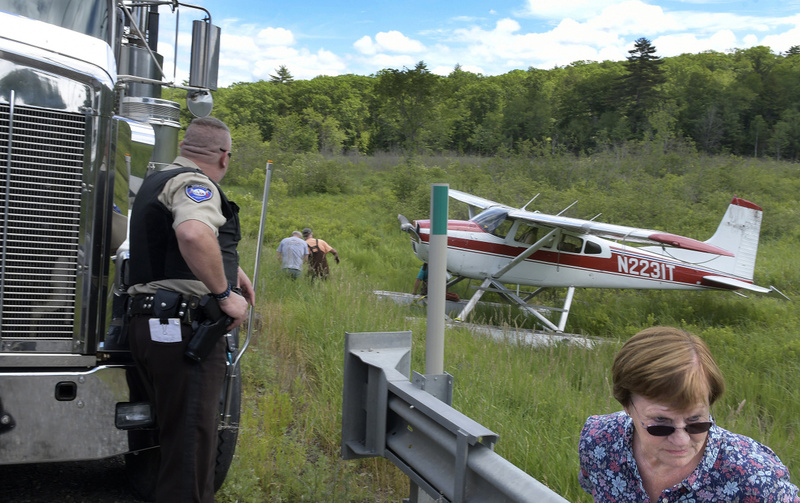 On Sunday, Holland said about 15 people were gathered at the bog to pull the plane out, first working to flip the plane right-side up, then pulling the plane across the bog with the help of trucks from Jordan Lumber in Kingfield to draw it close to the road embankment. Holland has posted the video to YouTube and plans to post a second video of the recovery. Morris said the crash was reported to the Federal Aviation Administration and the National Transportation Safety Board. Kathleen Bergen, a spokeswoman with the FAA, said Sunday that the aircraft owner needs approval from the FAA or the NTSB to move the aircraft. The aircraft has to be removed from the water and transported to a hangar at a local airport for the investigation and aircraft owners are responsible for having the aircraft moved.